Download "BB-18 Black Body High Vacuum System Technical Description"
1 BB-18 Black Body High Vacuum System Technical Description The BB-18 Black Body is versatile and is programmed for use as a fixed cold target at 80 K or variable target, at 80 K- 350 K no extra cost. The possibility to control to +/- 0.1 K is inherent in the mechanical and thermodynamic design. Ultimate control quality will be determined by the availability of stable and accurate temperature sensors and controllers. Aperture is 18 (457 mm); guaranteed active area 16 square other sizes on request. 1. Design Principles A. Main body BB-18 The main body will be copper with approximate mass so that evaporation of liquid nitrogen will change the temperature no more than 0.1 K. In auto tuning on/off a dedicated PID temperature controller will release a controlled amount of liquid nitrogen. B. Liquid Nitrogen Evaporation The liquid nitrogen evaporation system comprises of a proprietary nitrogen cooling Distribution system. 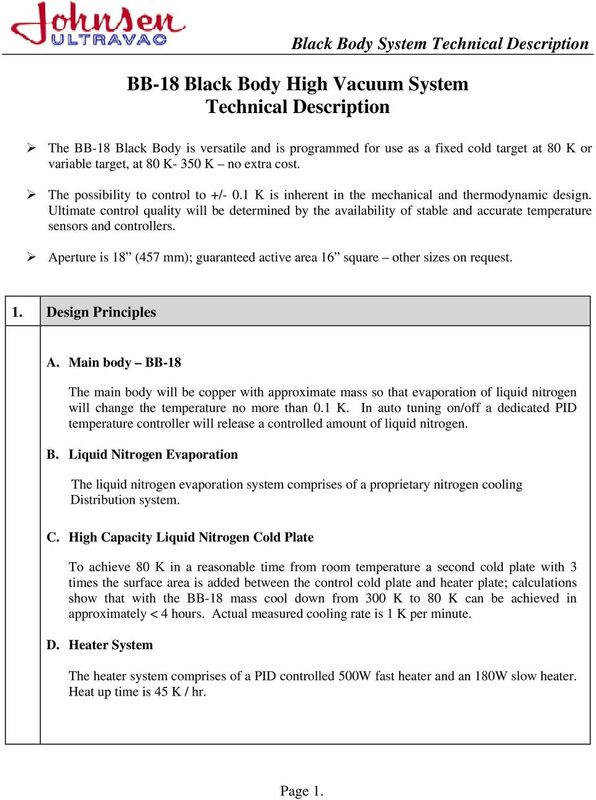 C. High Capacity Liquid Nitrogen Cold Plate To achieve 80 K in a reasonable time from room temperature a second cold plate with 3 times the surface area is added between the control cold plate and heater plate; calculations show that with the BB-18 mass cool down from 300 K to 80 K can be achieved in approximately < 4 hours. Actual measured cooling rate is 1 K per minute. D. Heater System The heater system comprises of a PID controlled 500W fast heater and an 180W slow heater. Heat up time is 45 K / hr. Page 1. 2 E. Mechanical Shutter for Aperture The system is supplied with a polished 304 SS sheet metal body. A hinged Aperture shutter is provided for this system. A mechanical handle is installed on a chamber pass-through flange which via a Bellows connection and SS cable can open or close the shutter; this will conserve nitrogen if the BB-18 system is idle at low temperature and allow for rapid set point changes with the lid closed. Pneumatic or stepping motor control is available as an option. F. Temperature Control System The system is supplied with temperature controller. There are 5 RTD sensors mounted on a small copper plate. This plate is attached to the radiant fin assembly with indium foil contact sheet and a small screw. The face of the sensors will be painted with the same paint as the face of the black body. The cold plate has one RTD for reference. G. PC Control System Controls for the BB-18 will be mounted in a small separate 19 rack. A PC based software package will provide data collection, display and control. A control screen graphic-mouse activated will be the operator interface; an Ethernet card is provided. H. Redundant Data Collection This system is equipped with 3 RS 232 and 3 IEEE 488 switches to connect to the instrumentation to the redundant data collection PC. An alarm is included to signal PC failure. A 2200 VA 1 Hr. uninterrupted power supply can be supplied to run the entire system for 1 Hr. 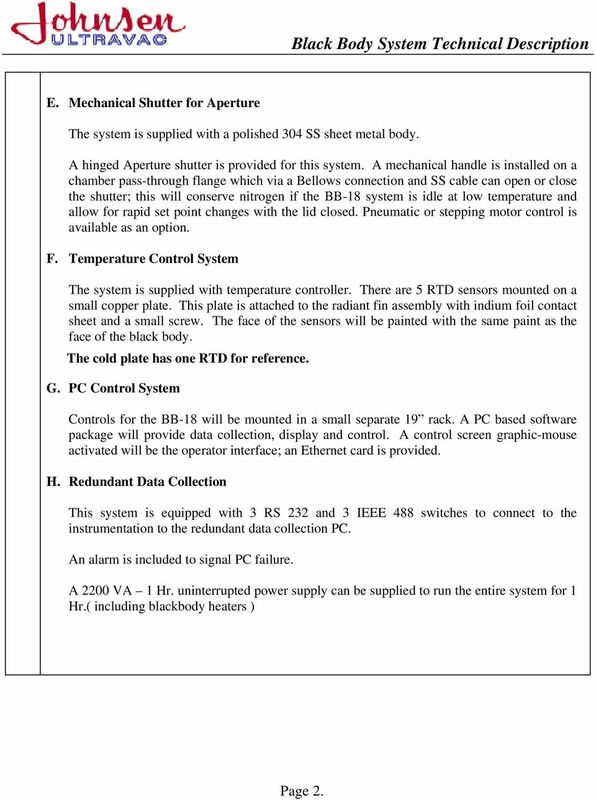 ( including blackbody heaters ) Page 2. 3 I. Wiring and LN distribution system Internal wiring will be standard ultra high vacuum bare wire with each wire separated by custom ceramic discs mounted on a thin wall tube to make rigid 1 metre sections. Overall length will be a function of the chamber dimensions. For the purpose of these specifications the vacuum chamber has a diameter of a nominal 5 meter. Each section has a 45 flexible joint with ceramic bead insulation ie. 5-90cm sections with 6 flexible joints. A multi-wire connector is provided at the black body. Liquid N 2 Reservoir A standard 4L liquid N 2 reservoir will be supplied. This system is equipped with a noncontact level sensor and controller. This system will be enclosed in a small vacuum vessel and mounted on a stand pipe on the wiring mounting flange. Liquid N 2 and gas return pipes extend in the stand pipe from the N 2 reservoir into the vacuum test chamber to connect to the tubing and to the black bodies. Liquid N 2 rated solenoid valves with extended stems activate the N 2 supply. The high and low flow solenoids are custom calibrated with outlet flow restrictions to supply the required flow rate. They are rated at 5,000,000 cycles. The reservoir is equipped with gas relief valve set at 0.1 PSIA higher than the highest barometer pressure known at location (Customer must supply this data to Johnsen). This assures a common non-variable boiling point for the system. Page 3. 4 J. Black Body Mechanical Details Features o o Guaranteed active area 16 square other sizes on request. Target plates 50 cm x 50 cm (nominal 20 square). o Opening 18 square. Ratio 2:1 o 3cm fins capture radiation with a minimum of 4 reflections to assure < 99% emissivity. 1) 4 Bounce emissivity At 75% = 98.81% At 90% = % 2) Heater Heater is Nichrome wire 50 cm x 50 cm long with copper cold pins to join segments. Wires are inserted into 1/8 DIA Quarz tubes and placed in slots in absorber plate max power 500 Watts. 3) Cold Plates Cold plate is a two stage system and cools 1 K per minute with 120 Kg total plate weight. 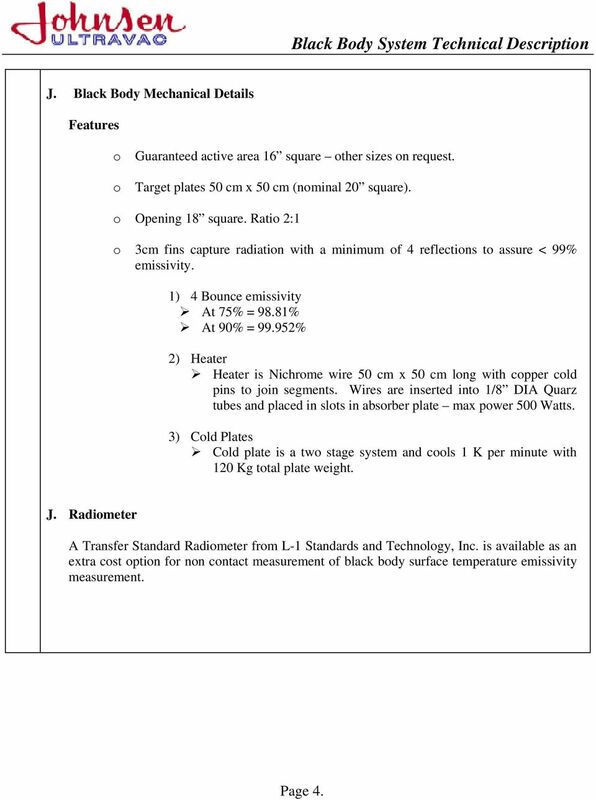 J. Radiometer A Transfer Standard Radiometer from L-1 Standards and Technology, Inc. is available as an extra cost option for non contact measurement of black body surface temperature emissivity measurement. Page 4. 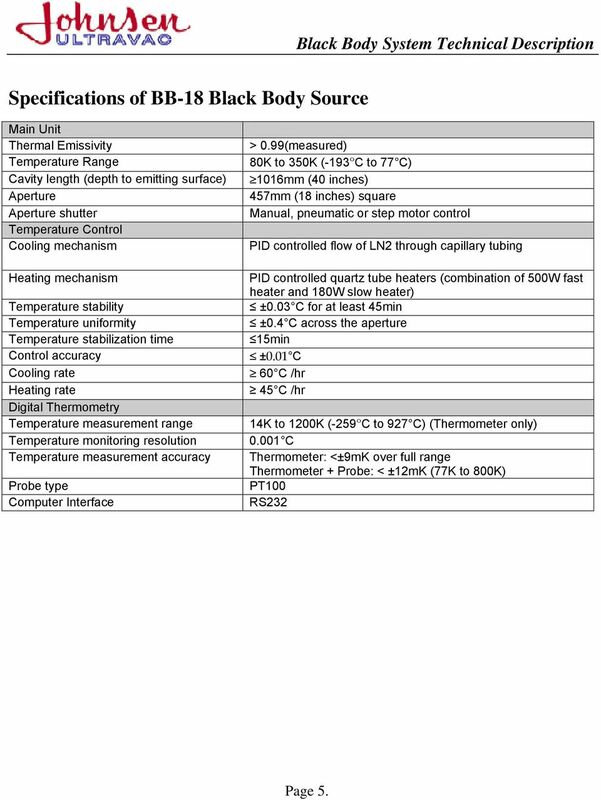 5 Specifications of BB-18 Black Body Source Main Unit Thermal Emissivity Temperature Range Cavity length (depth to emitting surface) Aperture Aperture shutter Temperature Control Cooling mechanism Heating mechanism Temperature stability Temperature uniformity Temperature stabilization time Control accuracy Cooling rate Heating rate Digital Thermometry Temperature measurement range Temperature monitoring resolution Temperature measurement accuracy Probe type Computer Interface > 0.99(measured) 80K to 350K (-193 C to 77 C) 1016mm (40 inches) 457mm (18 inches) square Manual, pneumatic or step motor control PID controlled flow of LN2 through capillary tubing PID controlled quartz tube heaters (combination of 500W fast heater and 180W slow heater) ±0.03 C for at least 45min ±0.4 C across the aperture 15min ±0.01 C 60 C /hr 45 C /hr 14K to 1200K (-259 C to 927 C) (Thermometer only) C Thermometer: <±9mK over full range Thermometer + Probe: < ±12mK (77K to 800K) PT100 RS232 Page 5. M A N U A L M E L - T E M P THE LOWEST COST MELTING POINT APPARATUS FOUND ANYWHERE! Low cost unit Temperature range to 500 C Aluminum casting conducts and radiates heat uniformly to capillaries and thermometer. Heat Transfer Series TSTCB Technical Teaching Equipment Products Products range Units 9.-Thermodynamics & Thermotechnics 2 Electronic console Modules. TXC/CLB. Linear Heat Conduction Module.2 TXC/CRB. Custom configuration such as modified angle dimensions, other flange standards, 3-way function, alternative materials.are available on request. MASS FLOW METERS Design Features n Rigid metallic construction. n Maximum pressure of 1000 psig (70 bars). n Leak integrity 1 x 10-9 of helium. n NIST traceable certification. n Built-in tiltable LCD readout. CoolTop A unique water cooled air-conditioning unit for server room cooling from the top AC-TOPx-CW-240/60 Application CoolTop is a new, unique air conditioning unit especially designed for datacenters. HI 766. HI 766 K-Type Thermocouple Probes. HI 766PA, Roller Surface Probe This probe is designed to measure the temperature of convex surfaces. What Should It be - Hand Held or Mounted IR Temperature Sensors? MODEL TEG-F20. 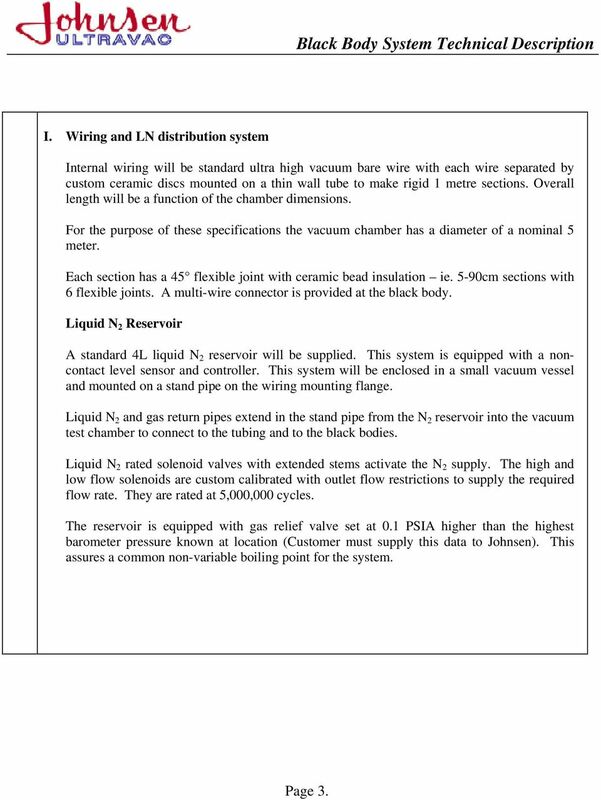 Specification Sheet. TEG-F20 Specification Sheet Ver. 2011-0310. Copyright(C) 2011 Tsukasa Sokken Co., Ltd. SECTION 5 COMMERCIAL REFRIGERATION UNIT 21 EVAPORATORS AND THE REFRIGERATION SYSTEM UNIT OBJECTIVES After studying this unit, the reader should be able to Define high-, medium-, and low-temperature refrigeration. VD series 53 Vacuum drying ovens Vacuum drying oven for non-flammable solvents A BINDER vacuum drying oven of the VD series is impressive while gently drying with its homogeneous temperature distribution. Simple temperature measurement using a PT100 loop powered temperature transmitter. Recommended Sous-Vide cooking devices for WS series controller Oct. 2007 Revised March. 2013 During the development of the Sous-Vide (SV) controller, we evaluated many different types of cooking devices.